We would like to highlight the Outstanding Reviewers for CrystEngComm in 2018, as selected by the editorial team, for their significant contribution to the journal. The reviewers have been chosen based on the number, timeliness and quality of the reports completed over the last 12 months. We would also like to thank the CrystEngComm board and the crystal engineering and crystalline materials community for their continued support of the journal, as authors, reviewers and readers. 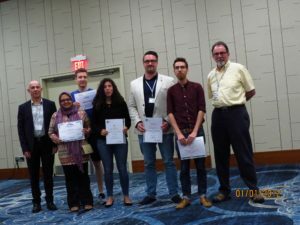 Congratulations to the CrystEngComm poster prize winners at PCCr2 2019! 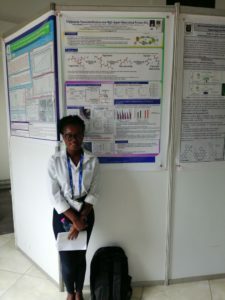 The Pan African Conference on Crystallography (PCCr2) was held 28th January – 2nd February in Accra, Ghana. 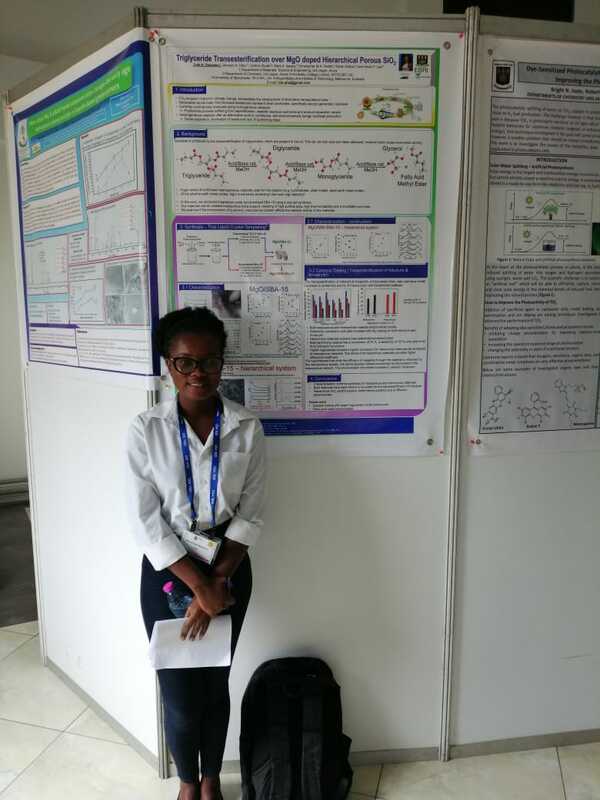 The conference was open to researchers, academics, students and individuals from all over the world with the aim of creating a platform for sharing knowledge, promoting networks and establishing collaborations to further the development of the continent through science and engineering. The winners received a journal certificate, a book voucher and a free subscription to CrystEngComm. CrystEngComm sends hearty congratulations to the winners! Congratulations to Rahul Banerjee for winning the Shanti Swarup Bhatnagar Prize! Rahul Banerjee, an Associate Editor of CrystEngComm, was recently awarded the Shanti Swarup Bhatnagar Prize for Science and Technology by the Council of Scientific & Industrial Research (CSIR) India. The award, named after the first director-general of the CSIR, is given annually to 8-10 researchers up to the age of 45 for notable and outstanding research in one of seven disciplines. 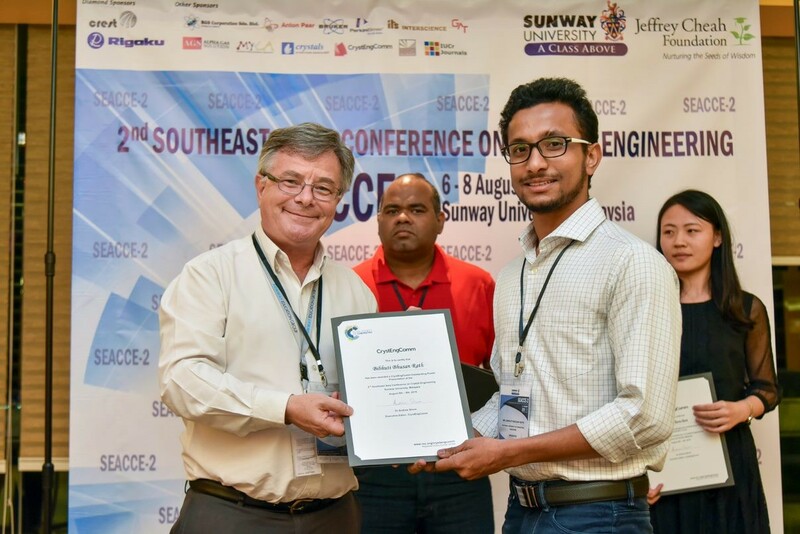 Rahul, who is based at the Indian Institute of Science Education and Research (IISER), Kolkata, was awarded the prize in the field of Chemical Sciences for his work on structural chemistry with applications in hydrogen storage and carbon capture. Rahul recently guest edited a CrystEngComm themed issue on Covalent organic frameworks and organic cage structures, along with Neil R. Champness. The whole team here at CrystEngComm would like to offer a huge congratulations to our colleague Rahul for this immense achievement! This past July the 5th European Crystallographic School (ECS5) was held in Stellenbosch, South Africa. The event is aimed at providing young researchers with a comprehensive overview of all aspects of crystallography. An international selection of lectures covered a diverse range of topics ranging from fundamentals such as point groups and space groups to applications of the technique in biology and materials science. The school was a huge success, attracting over 60 participants from 10 countries across Europe and Africa. 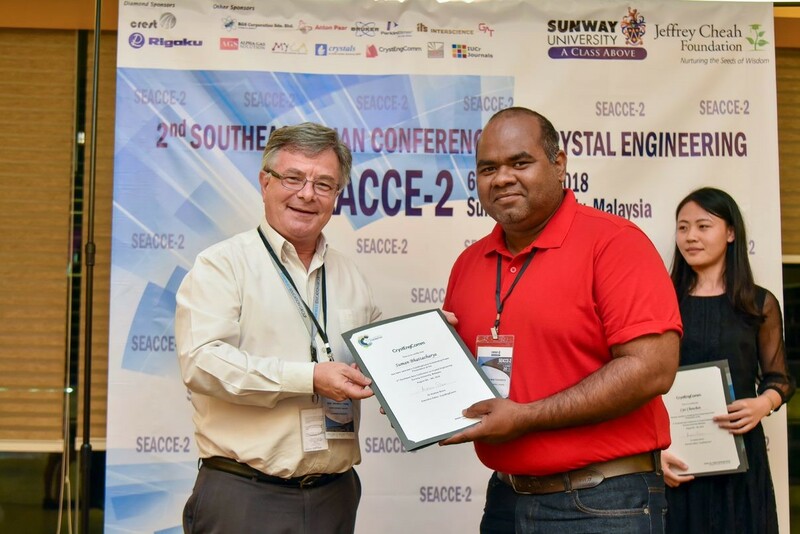 CrystEngComm was pleased to support the event by providing the participants with free subscriptions to the journal, as well as book vouchers which were awarded for active participation. 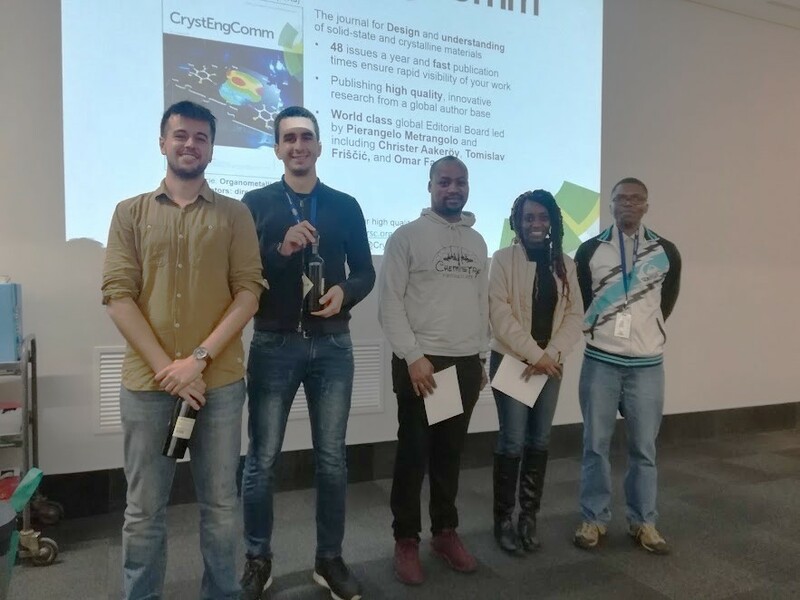 The winners were Jacky Bouanga Boudiombo (University of Cape Town) and Siyabonga Hulushe (Rhodes University), with honourable mentions going to Aleix Tarrés Solé (CSIC), Stanley Manzini (Sasol Group Technology) and Marco Bardini (University of Cape Town). CrystEngComm offers sincere congratulations to the winners and would like to wish all participants the best in their future research. 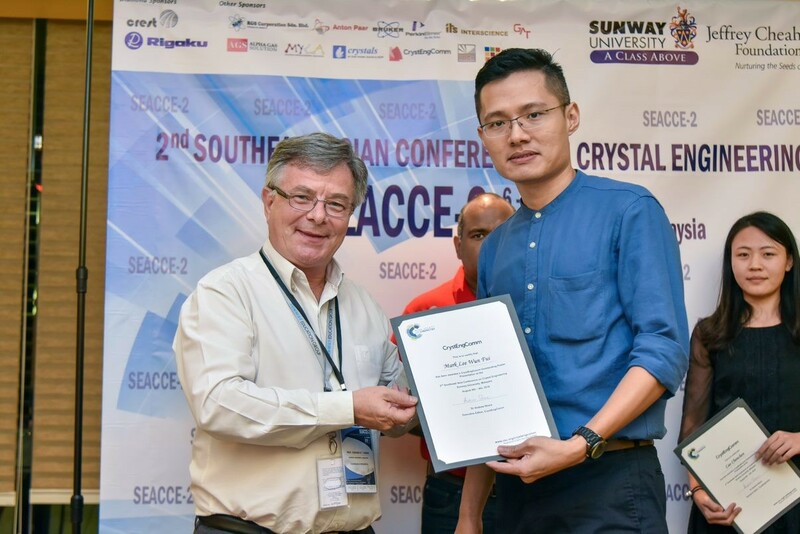 This August the 2nd Southeast Asian Conference on Crystal Engineering (SEACCE-2) was held at Sunway University, Malaysia. Hosted by Professor Edward R.T. Tiekink, Head the Research Centre for Crystalline Materials at Sunway, the event aims to bring together researchers from Southeast Asian Nations, along with China and India, to discuss recent advances from across the fields of crystallography, crystal engineering, supramolecular chemistry, and more! Over 100 delegates participated in the activities with good representation from Thailand, India, The People’s Republic of China, Singapore, Indonesia, Pakistan, Bangladesh and hosts Malaysia. Featuring internationally renowned keynote speakers Gautam Desiraju, Chen Xiao-Ming and Jagadese J. Vittal as well as submitted talks and poster presentations, the conference gave emerging investigators and students to network with some of the leaders in the field. CrystEngComm was pleased to support the event by offering awards for outstanding flash poster talks. The presenters were challenged to communicate and highlight the significance of their research effectively in three minutes using only a single static slide. 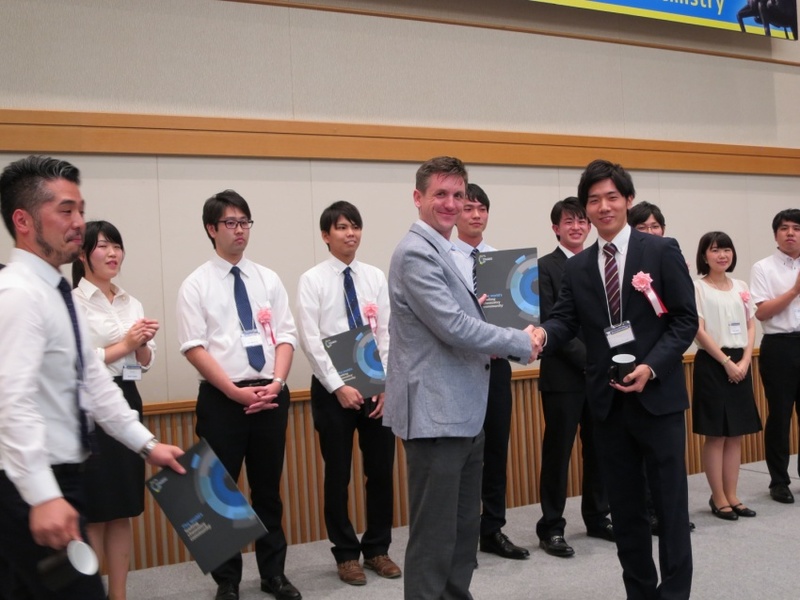 All prizes were presented by conference Chairman Edward Tiekink, the winners recieved a journal certificate and free subscription. 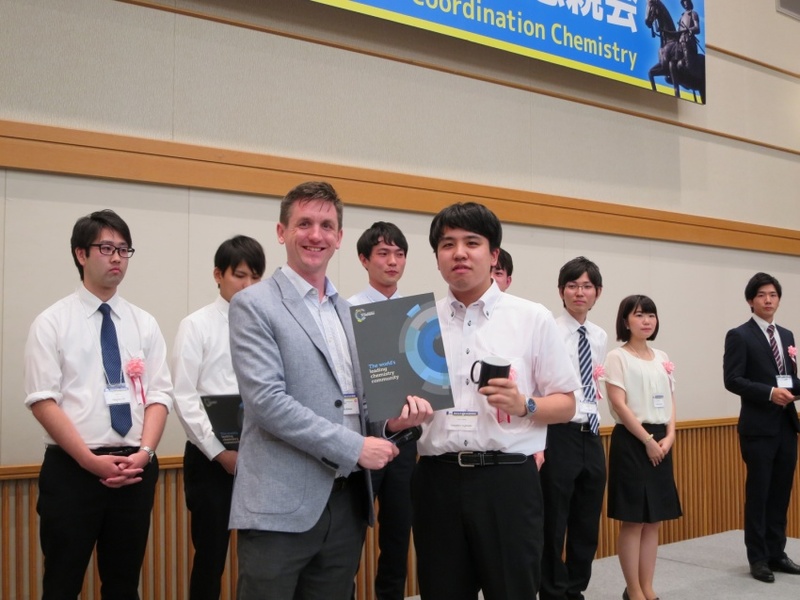 CrystEngComm and the RSC offer a hearty congratulations to all poster prize winners! 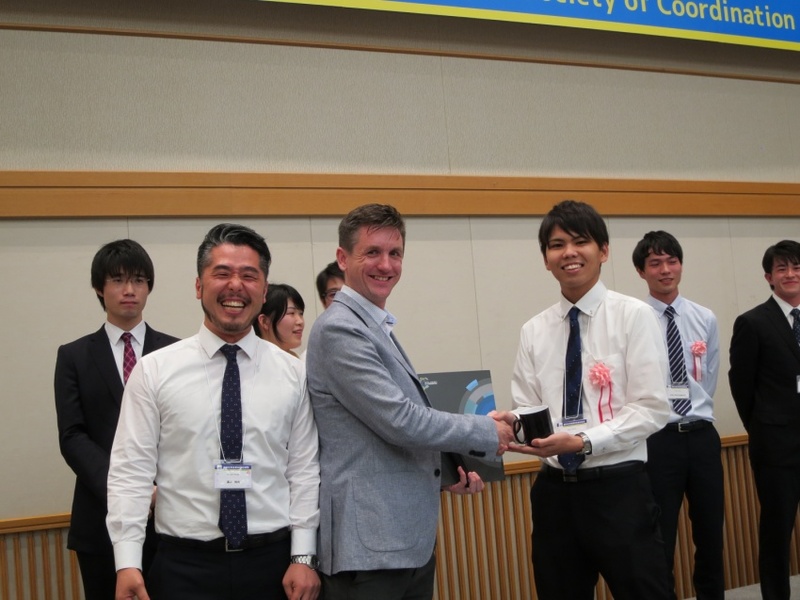 CrystEngComm‘s Deputy Editor, Mike Andrews, and the RSC’s Editorial Development Manager for Japan, Hiromitsu Urakami, were on-hand to award poster prizes for the best student poster presentations. 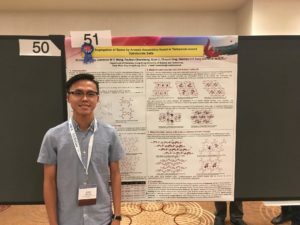 Congratulations to the CrystEngComm poster prize winner at ACA 2018! Aristyo works in the group of Professor Ian D. Williams at the Hong Kong University of Science and Technology. CrystEngComm would like offer a hearty congratulations to Aristyo for his excellent poster presentation! Meet our new Editorial Board Members! We are delighted to introduce Professors Susan Bourne and Dongfeng Xue as the newest members of our Editorial Board and are very happy to be able to welcome them to the team, and look forward to working closely with them on shaping the future of CrystEngComm! 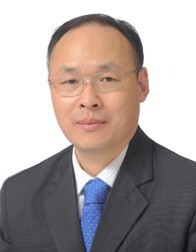 As a CrystEngComm Associate Editor, Professor Xue will be handling submissions in the areas of crystal growth, nanomaterials, polymorphism and crystal engineering techniques. Submit your research or reviews to CrystEngComm – see our author guidelines for information on our article types or find out more about the advantages of publishing in a Royal Society of Chemistry journal. Congratulations to Luca Catalano, a CrystEngComm author and former PhD student of Pierangelo Metrangolo, our CrystEngComm chair. 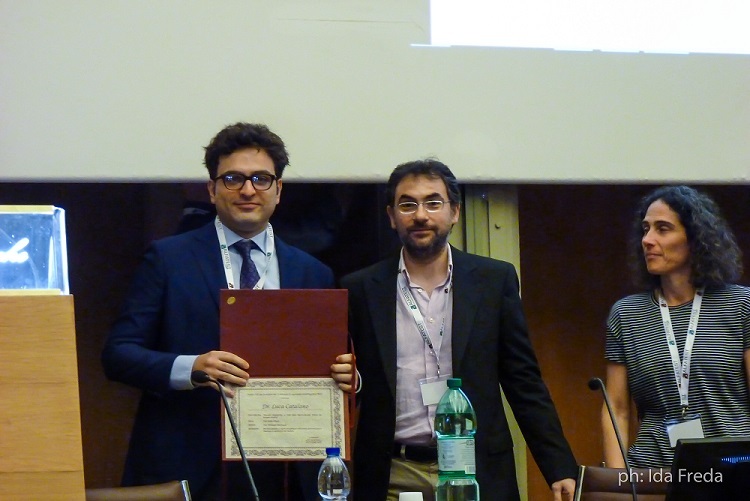 Luca has won a prize for best PhD thesis at the Italian Association of Crystallography which took place last month in Rome, Italy. His thesis was titled: ‘Towards Engineering of Solid-State Supramolecular Rotors via Halogen Bonding‘. Luca currently works as a post-doctoral researcher for Pance Naumov’s group. This month saw the occasion of the 3rd International Symposium on Halogen Bonding, held in Greenville, South Carolina and chaired by Professor Bill Pennington (Clemson University). 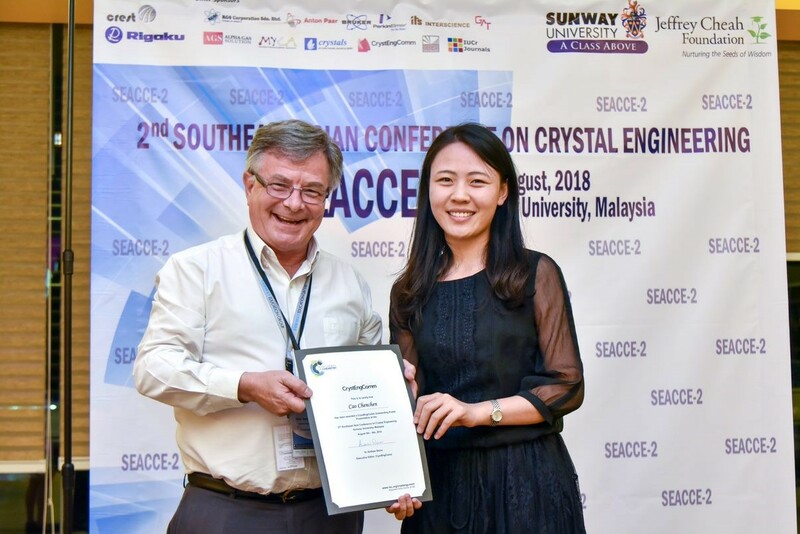 The event was a huge success, attracting over 90 participants from 21 countries, who came to discuss the latest developments in this exciting field of crystal engineering. Covering topics ranging from fundamentals like the refinement of the σ- and π-hole model to applications in fields such as pharmaceuticals, catalysis, and functional materials, the discussions were broad and vibrant – in part due to a strong showing of early career researchers. Three such promising academics presented in a special Rising Stars session, which CrystEngComm was pleased to support. 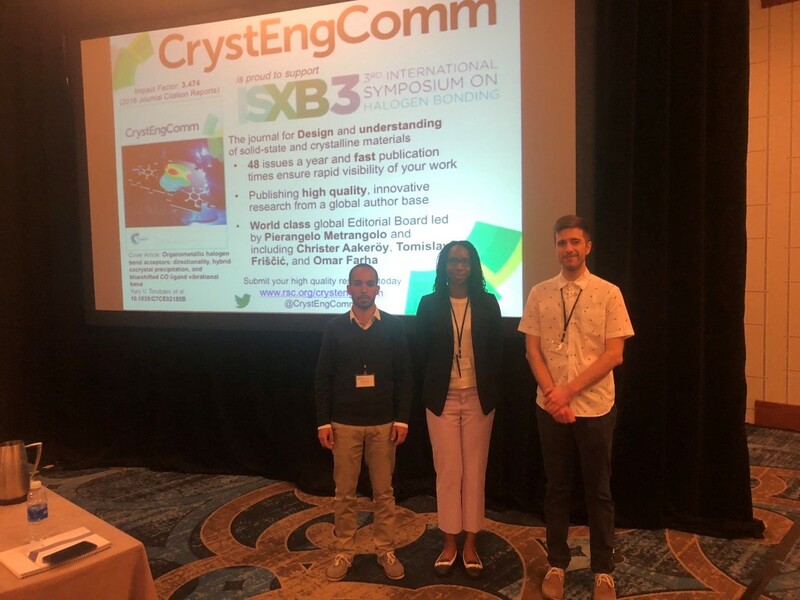 Presenting in this session was (pictured, left-to-right) Rafael Nunes of the University of Lisbon, Professor Davita L. Watkins of the University of Mississippi, and Dr Filip Topic of McGill University, they each received discounted registration and a personal invitation to submit to CrystEngComm. 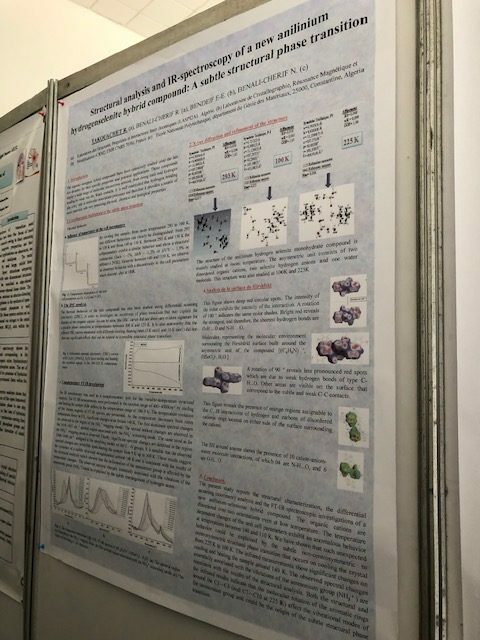 Immediately prior to the symposium was a satellite workshop on the IUPAC project to characterize chalcogen, pnictogen, and tetrel bonds – analogous interactions in which Group 14-16 element act as the electrophilic sites. Organized and Chaired by Professor Giuseppe Resnati (Politecnico Milano), the workshop featured a lively poster session and the RSC provided awards for two of the researchers presenting their work. The CrystEngComm prize went to Patrick Wonner of Ruhr-University-Bochum for his poster entitled “Carbon-halogen Bond Activation by Selenium-Based Chalcogen Bonding“, while the NJC prize went to Asia Marie Riel of Université de Rennes for her poster entitled “Isolated and Expanded Chalcogen Bond Halide Networks” (both pictured below). 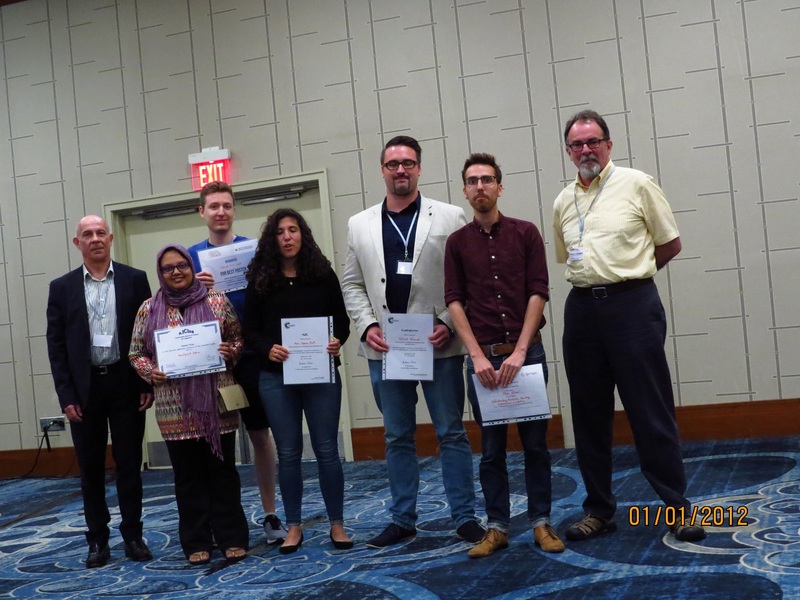 Left-to-Right: Giuseppe Resnati (Chair of IUPAC Workshop), Khadijatul Kobra (winner of AICIng poster prize), Patrick M.J. Szell (winner of ACS poster prize), Asia Marie Riel (winner of RSC NJC poster prize), Patrick Wonner (winner of RSC CrystEngComm poster prize), Alex Elmi (winner of Springer poster prize), and Bill Pennington (Chair of ISXB-3). CrystEngComm offers a huge congratulations to all Rising Stars and poster prize winners!